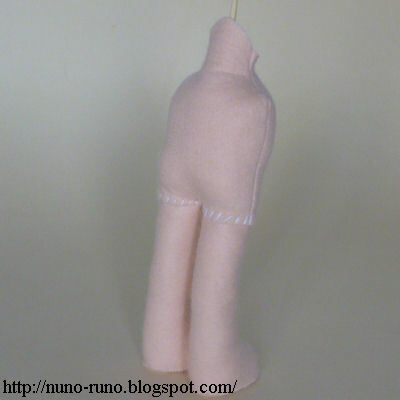 Put together the body, legs and arms of simple felt doll. 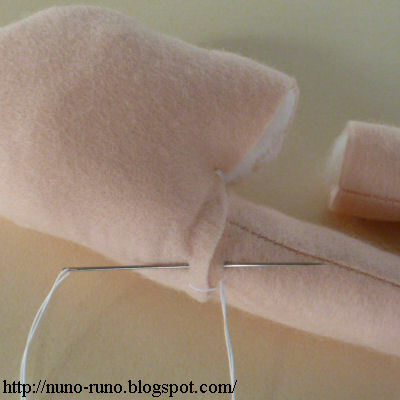 Sew the middle of the bottom of the body with a thick thread. Stitch the legs to the body. Insert the wire of arm into the shoulder. Stitch the arm. Insert the stick into the head. Stitch the neck to the head with a thick thread. 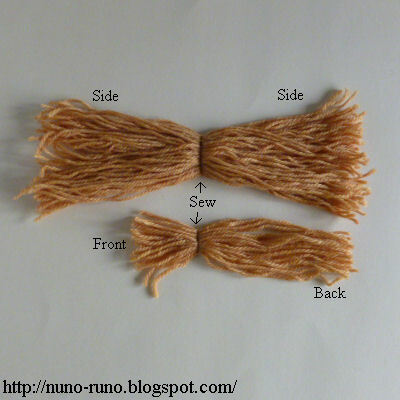 Make 2 bunches of yarn. 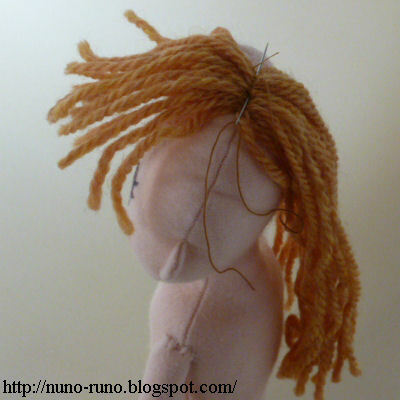 Sew the hair of front and back to the top of head. Put the side hair on the front and back hair. Sew it at the middle. This doll is the same type as Little Wedding Dolls and Santa Claus. This doll Looks woderfull. Thank you for sharing. Thanks for grea tutorial, Rino! I like so much your doll! I just made a doll off this pattern and love her! Thanks so much for sharing! HI, is there anything special you do make her stand on her own? Thank you , Runo. 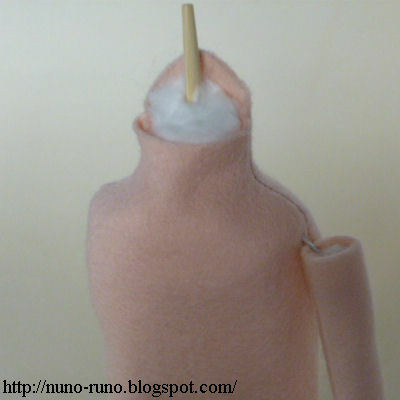 A lovey doll and simple to make with your very clear patterns and instructions. Really kind of you to share that.Much appreciated. 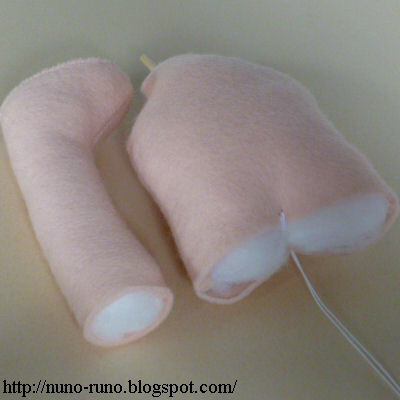 What stitches do you use to attach the limbs and head to the body? It's a lovely pattern. I just got a new sewing machine and want to try it out. Used ladder stitches at the head. About limbs I don't know the name of stitch. Hi Runo. I absolutely adore your doll! 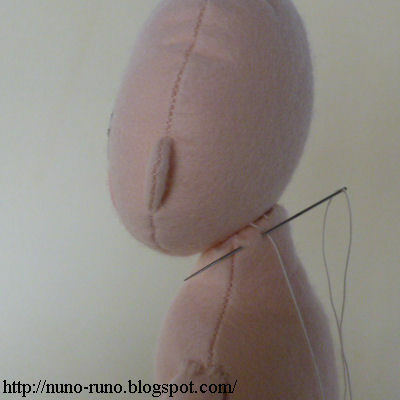 Do I have to stitch the neck of the doll closed before attaching the head to it? You can attach the opened neck to the head. 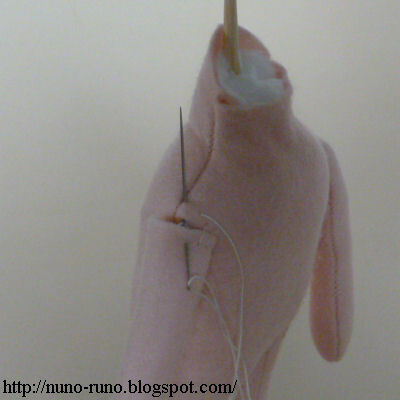 > Do I have to stitch the neck of the doll closed before attaching the head to it?